There will be plenty of demand for technology talent and experienced senior professionals in the Vietnamese job market next year, according to the 2019 Salary Survey released recently by the UK-based Robert Walters. Robert Walters’s “Come Home Pho Good” programme helps companies identify and hire overseas Vietnamese professionals. 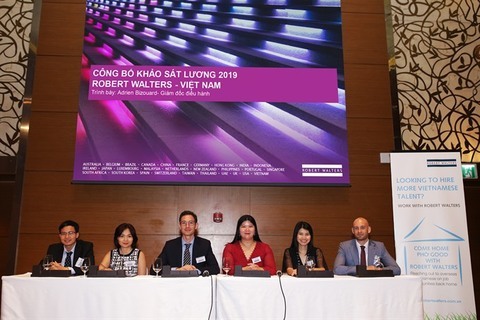 Adrien Bizouard, country manager of Robert Walters Viet Nam, said: “In 2018 we saw salaries begin to stabilise as the Viet Nam market matured and in 2019 job movers can expect an average increment of 15-25 per cent. In 2018, Viet Nam’s manufacturing and engineering sectors continued to enjoy growth, with both new entrants and existing players expanding. The establishment of Viet Nam’s first major local auto company has created numerous jobs in related businesses such as equipment and part manufacturing. Technology was another sector that experienced rapid growth, with the country emerging as a regional tech hub, and some even dubbing it the ‘Silicon Valley of Asia’. A good number of tech start-ups from Asia, Europe and the US entered the market, driving demand for senior tech roles. Sales and marketing professionals, particularly in building and construction or related sectors, were also sought after. Most of these positions were expansionary in nature, driven by real estate developers undertaking large projects in HCM City. The annual survey suggests that Viet Nam’s established market in 2019 will lead to a greater need for senior talent who have experience in stabilising and leading companies to greater growth. Given the shortage of people with the necessary skills and expertise, employers might have expand their search to Vietnamese talent overseas. In the last two years, around 5,000 overseas Vietnamese were contacted and over 1,000 said they would like to work in Viet Nam if they could find proper jobs. Of them, 31 have already come to the country to work. To secure top talent, companies should look at optimising the recruitment process. This involves ensuring it is kept short so that candidates remain engaged and communicating clear expectations and job descriptions right from the outset. Retention will be a major challenge companies continue to face, particularly of junior- to mid-level professionals, who are often on the lookout for new experiences and greater growth. To overcome this, companies will need to provide exciting opportunities for up-skilling and development. The annual Salary Survey for 2019 focused on Viet Nam and other countries in South East Asia.